Drawing has always been an essential tool to the sculptor, and many sculptors have carried their experimentation with materials into work on paper. For many sculptors there is a clear demarcation between the two disciplines, and many sculptors make drawings that are autonomous, and independent of their work in three dimensions. The practice of drawing and of sculpture is intimately linked in the practice of these international artists. The point at which an artwork becomes a sculpture as distinct from a drawing can, in instances, be blurred. Some of the artists produce works on paper that fall within the more traditional definition of drawing. 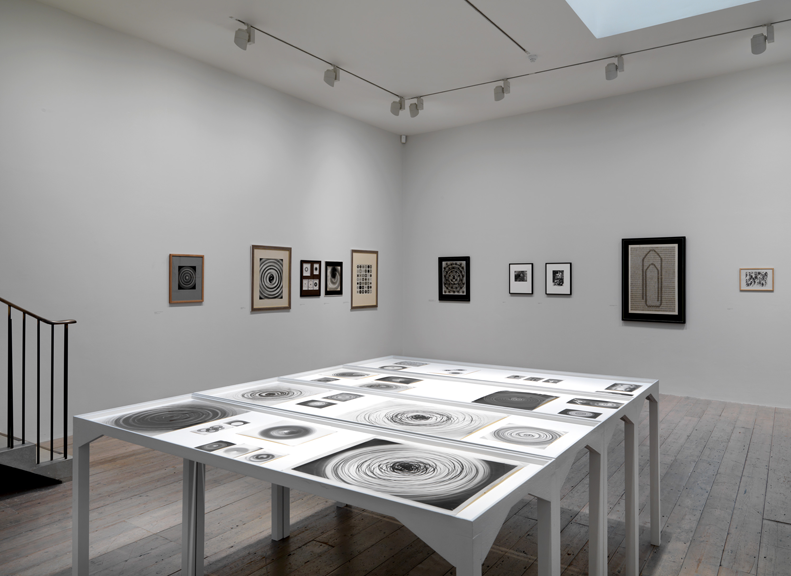 Yet it is rare for these works on paper to be exhibited in isolation from the 3-D work – there is reciprocity between the two. Anna Barriball and Dan Shaw-Town share an employment of repetitive graphite mark-making. This attention to process and the passage of time is countered by the formal strategies of Minimalism such as the employment of rectilinear shapes, the grid and serialisation. Sara Barker and Aleana Egan use line to negotiate responses to visual and literary influences and to conjure open yet resolved forms. Knut Henrik Henriksen has an interest in questioning and redefining architectural spaces, paying particular attention to the in-between and contradictory, and leaving the work open to adaption to different environments. Alice Channer and Bojan Šarcevic create works that are hard to define, incorporating a wide range of materials and procedures that pay attention to details, combining the domestic, the body and the mechanical. 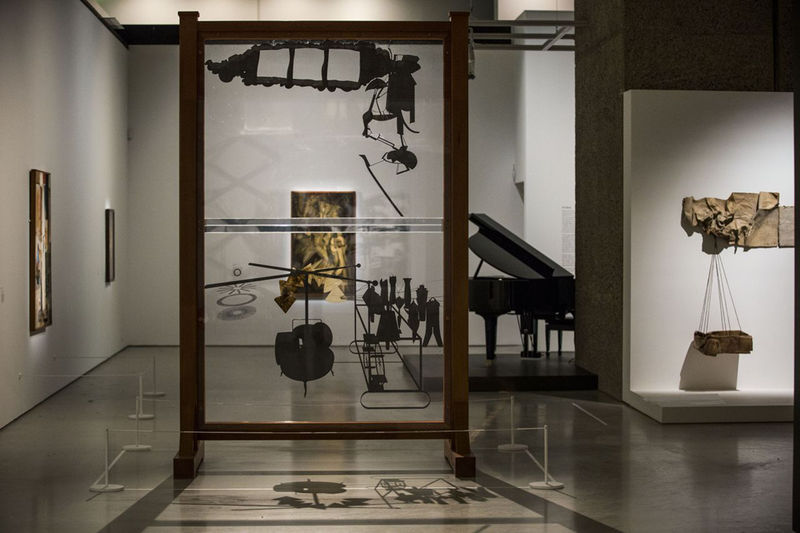 Raven Row presents the first posthumous retrospective of the work of Czech artist Běla Kolářová (1923–2010). The show is both the first solo exhibition of the artist in the UK and the first major survey of her work outside the Czech Republic. From her trademark ‘artificial negatives’, ‘light drawings’ and ‘derealised portraits’ to her assemblages and collages, Běla Kolářová pioneered an art based on intimate objects often associated with domesticity and the feminine. The works on display will span Kolářová’s career to include documentary photographs from the late fifties, camera-less experiments, ‘arranged photographs’ of objects and hair and assemblages from the sixties, as well as make-up drawings and assemblages from the seventies and eighties. While rooted in the context of the Cold War and exile, Běla Kolářová’s practice is also closely linked to the life of her husband, the influential artist and poet Jiří Kolář, whose work overshadowed her own until its recent rediscovery. Despite the difficulties of exhibiting in her own country, she was able to develop a unique body of work, both formally and conceptually. As this exhibition will demonstrate, its legacy to the history of art – on both sides of the Iron Curtain – is anything but modest, unlike its materials and its author’s personality. 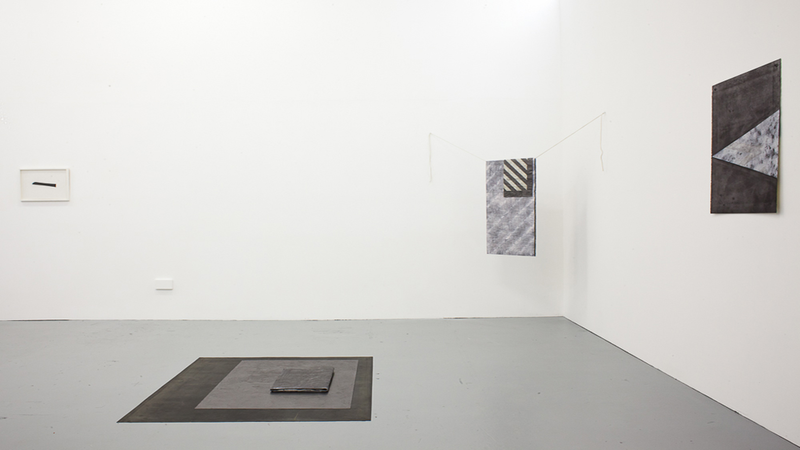 Gasworks presents The Black Cave, the first UK solo exhibition by Beatriz Santiago Muñoz. Consisting of newly commissioned moving image works, the exhibition focuses on the relationship between landscape, history and infrastructure in the artist’s home country of Puerto Rico. Often documenting her interactions with specific individuals and communities, Santiago’s films and videos focus on how social relations are embodied in particular places and gestures. Drawing from anthropology and experimental theatre, the artist develops her work together with the people she portrays, using performance and re-enactment as strategies for self-representation. Her previous works range from an interview with controversial Puerto Rican artist Carlos Irizarry, subsequently interpreted through dance, to an observational documentary about the routine tasks of present-day anarchist communities in San Francisco. For her exhibition at Gasworks, Santiago has produced two new works that explore the contemporary landscape of Puerto Rico through an historical lens. The video La Cueva Negra (2013) investigates the transformation of a former archaeological site, whereas the 16mm film Farmacopea (2013) looks at how distinctive features of the island’s natural landscape relate to the development of agriculture and tourism. Using different strategies, the works in The Black Cave recuperate images and understandings of the Puerto Rican landscape that have quite literally been buried beneath a growing infrastructure of transport and tourism. Exploring one of the most important chapters in the history of contemporary art, The Bride and the Bachelors: Duchamp with Cage, Cunningham, Rauschenberg and Johns focuses on Marcel Duchamp ’s American legacy, tracing his relationship to four great modern masters – composer, John Cage, choreographer, Merce Cunningham, and visual artists Robert Rauschenberg and Jasper Johns. Encountering Duchamp and his work in the early stages of their careers, each of the younger artists embraced key elements of his ideas and practice, resulting in a seismic shift in the direction of art in the 1950s and ‘60s. Characterised by the integration of art and life, the work of Cage, Cunningham, Rauschenberg and Johns heralded the advent of Pop Art. The Bride and the Bachelors features around 90 works, some by Rauschenberg and Johns are being shown in the UK for the first time. The selection reflects the artists’ multiple levels of engagement across the disciplines of art, dance, and music. Leading contemporary artist Philippe Parreno has devised a dynamic experiential staging of the exhibition inspired by the choreography of Cunningham and music of Cage, featuring two Yamaha Disklavier pianos playing live Cage scores, while the ‘ghost’ of the dancers can be heard pounding the floor. The soundscape is also punctuated by Parreno’s own interpretation of Cage’s famous 4’ 33”. WE OBJECT! is Aid & Abet’s first exhibition of 2013 curated by artist Benedict Drew. For this exhibition Benedict Drew has brought together an exciting group of contemporary artists working in diverse media with a particular interest in the body’s intersection with the object, with machines effect on the physical and how text and speech can unfold scenarios where the world and the body collide. WE OBJECT! will expand across the whole of Aid & Abet’s warehouse space and display works in video, performance, sculpture, sound, film, music and text, in order to reveal an intriguing and creative engagement with material, image and object. Subject to Constant Change is the most comprehensive solo presentation of works by Italian-German visual artist Rosa Barba to date. The exhibition is a unique collaboration with Cornerhouse, Manchester that creates a multi-sensory, spatial experience showing the many dimensions of Barba’s practice, including recent film sculptures and a newly commissioned installation. Barba playfully explores cinema’s material elements: the physical characteristics of film (light, projector, celluloid filmstrip, screen, and sound apparatus) and the structure of cinematic narrative. Central to the exhibition is a major new multi-platform film installation, Subconscious Society, which considers the end of the industrial age in favour of an age of technology. A Factory as it Might Be is an exhibition and ongoing research project conceived by artist Patrick Staff. The project takes William Morris’ eponymous 1884 text on the re-imagining of the factory, and Colin Ward’s response in The Factory We Never Had (1994), as points of departure for reflexively examining contemporary sites of production, education and social space, and the intersections between industry and leisure, performance and congregation. Following its first iteration as part of the The Island’s programme for the 2012 Whitstable Biennale, A Factory as it Might Be (Bournville) relocates to International Project Space and its home in Bournville, where an art school has existed for over 100 years. The school, built by Cadbury as a day continuation school for its workers, occupies a series of buildings around Bournville Green a short distance from the Cadbury factory established in 1879. Known as ‘The Factory in a Garden’, Bournville was cited by Morris as exemplifying a positive shift towards re-establishing the factory as a space of both production and sociality at the heart of the community. The pending relocation of the current art school campus to a new building in the city centre provides the backdrop for this iteration of A Factory as it Might Be, a shift that is being undertaken amidst a governmental assault on culture, welfare, education and social equality. The relocation from Bournville’s more traditional craft-oriented campus to the office-like environment of the new building typifies the current transformation in the arts and education driven by state aims which will necessitate artists, organisations and universities to employ an increasingly entrepreneurial role within the cultural sector. A Factory as it Might Be will be International Project Space’s last exhibition in Bournville. Haroon Mirza is a young British artist working in London. Untitled Song featuring Untitled Works by James Clarkson combines retro found furniture, disembodied speakers, bits of drum kit, wires and LEDs, in a work that hovers between sound and vision, sculpture and music, analogue and digital. Four of the sculptures in the show were produced by Sheffield based artist James Clarkson later modified by Mirza. 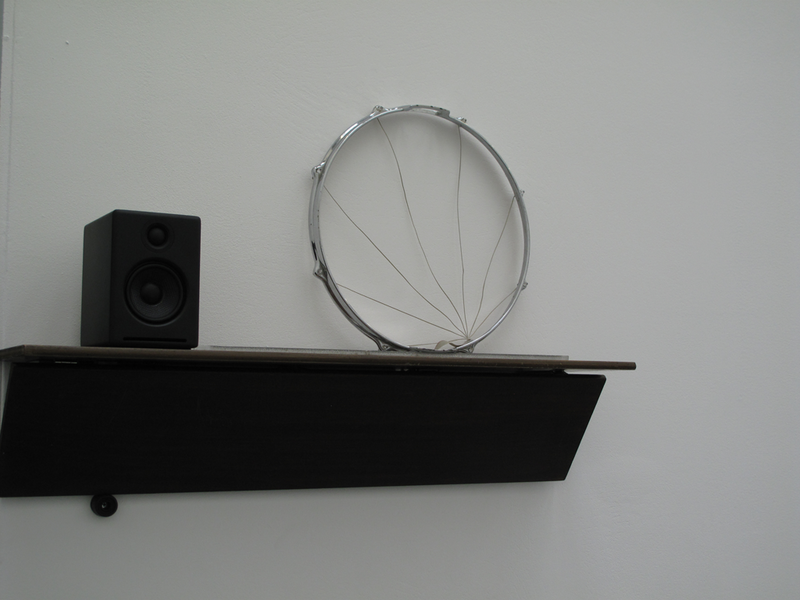 Image: Haroon Mirza, Installation view, /|/|/|/|/|/|/|/|/|/|/|/|/|/|/|/|, Spike Island (Jan-Mar 2012), Untitled Song featuring Untitled Works by James Clarkson, 2012 (detail). Courtesy the artist and Spike Island. Photo: Stuart Whipps.